The Newport County Chamber of Commerce’s Excellence in Business Awards, sponsored by Carey, Richmond & Viking Insurance, were established to recognize the variety of businesses that operate and thrive in Newport County and Rhode Island. Applications were reviewed and judged by a selection committee made up of Board and Committee members. Business innovation, customer service, growth, industry leadership, community service, and other local, regional and national recognition were among the factors weighed by the committee. “We are absolutely thrilled to be named Large Business of the year by our Chamber of Commerce,” said Debbie Neves, Director of Sales for the Newport Harbor Hotel & Marina. -The Newport has continuously given back the community by volunteering time to several organizations such as The Newport Music Festival. -The staff has “Jeans Friday” which is an opportunity for the team to wear jeans on Friday’s with a $5 donation. The recipient of “Jeans Friday” donations in 2018 was Lucy’s Hearth which is a 24-hour emergency and transitional shelter for families and their children who are homeless due to economic hardship, family crisis, and divorce. -The General Manager, Kristine Cox, serves on several boards such as the Convention and Visitors Bureau and The RI Hospitality Association. As DOS, Debbie previously served on the chamber board and lead the Emerging Leaders Committee which is sponsored by their restaurant, Saltwater. 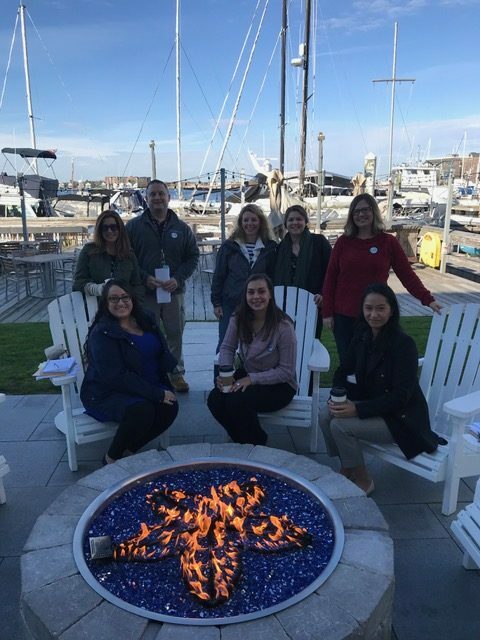 -The committee was very impressed that hourly associates at The Newport do not pay a weekly premium for medical benefits as well as their monthly Spirit of Newport celebration. This celebration includes recognizing the employee of the month and all staff members mentioned by guests in survey’s and on social media. The employee of the month receives a special parking space for the month as well a plaque, financial reward, and is eligible to win employee of the year. The award winners were divided into 5 categories and will be presented at this year’s Annual Meeting, scheduled for Wednesday, January 30, 2019. Congratulations to the management and associates for this prestige’s award! So wonderful!!! Not to mention your community service during the gas outage! Love this place!! Congratulations Everyone!! What an honor!! Looking forward to seeing & meeting you all in March! Congratulations to a Phenomenal Team ! I love the Jeans Friday $5 donation to help Lucy Hearth helping children & families. Great work! Great Team Newport! You all make us very proud, Team Newport! Congratulations #TeamNewport! Truly an amazing team and hotel, led by an exceptional leader!